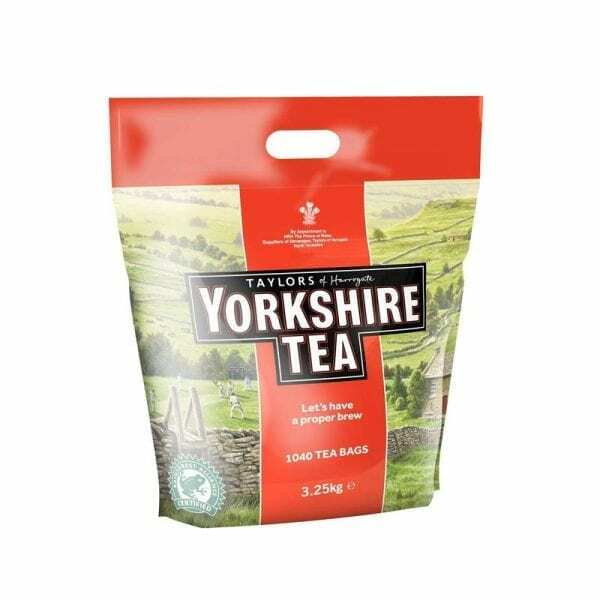 Anyone who enjoys a stirring brew need not look any further than Yorkshire Tea. This iconic brand has been a household name in Britain for decades, and its enduring popularity isn’t without good reason. Yorkshire Tea goes to extraordinary lengths to find the very best blend, tasting thousands of teas in search of the finest flavour. Rich, refreshing and packed with flavour, Yorkshire Tea only uses the very best ingredients from Africa, Sri Lanka and Assam. Yorkshire Tea is also Rainforest Alliance certified. These packs each contain 1,040 one-cup Yorkshire Tea bags. Tea bags bringing you a proper brew! Yorkshire Tea go to great lengths to make tea properly, from tasting 1000s of teas a day to find the best for our blend, to thinking about the water you’ll brew it with at home. And over the years, we built relationships with some of the world’s top tea estates, visiting them in person as much as possible. Use water that has boiled just once, any more than that and the oxygen level in the water is reduced, which can cause your tea to taste a bit ‘flat’. In a mug: Pour the freshly boiled water directly onto your tea bag in the mug. This way the tea infuses better than when you add the tea bag to the water. Leave to ‘brew’ for 2-3 minutes, according to your taste. Remove the bag with a spoon giving it just one squeeze. Add sugar/sweetener and milk, if desired. The tea is rich, refreshing and full of flavour blended in the Yorkshire Dales. A proper brew! Pure and simple! Yorkshire Tea uses only the very best teas from Africa, Assam and Sri-Lanka.